Check out the stuff I bought, and see if the stories and prices are right for you. There are times when characters in love are necessary to the story. This is not one of those times. Carina unknowingly infected Tanner via saliva with a killer illness. The plot does not require them to be in love. Carina could have gone on the run with anyone she may have kissed. This takes place BEFORE the book begins, so we’re told right from the start that Carina and Tanner are in love. And we’re repeatedly reminded throughout the novel, often bordering on border prose. It’s TELLING, rather than showing. Because we haven’t seen them face struggles hooking up, it’s hard to care for their love. I don’t ship it. Neither of the characters stands out on their own, or together. Which means you’d hope to be invested in the plot instead. Alas, no. The thing with thrillers is that you can change location, and go on the run as many times as you want. But if the story doesn’t advance, and it’s just an extended chase sequence… *shrug* Albanians are the antagonists here, so it’s not sterling rep for that country’s people. I’m not sure how a story with a dangerous, life-threatening infection could be so shrug-worthy, but here we are. I’ve read much better books by the same author – try Garden of Stones instead. Yes, this is coming a week late, but it took time to summon up the brainpower to even write a single paragraph about a book. In the end, I reviewed six books, and wrote a paragraph for a seventh. CONTENT WARNING: Suicide threat, partner murder, child abuse. This has been terribly mis-marketed. The UK edition has the word “thriller” TWICE on its back cover: one as a classification, and one in publisher’s hype. This wouldn’t be a problem, except…this book is not a thriller. I’d call it general/mainstream fiction. Anyway, the mislabelling could explain the middling reviews – people did not get what they expected. Also? The novel’s summary talks about an event as if it takes up the whole story, which was what I expected. Instead, that event is resolved within the first few chapters. That’s it. And entire chapters feature nothing but shopping, cleaning, and inventory. I’m not even exaggerating. 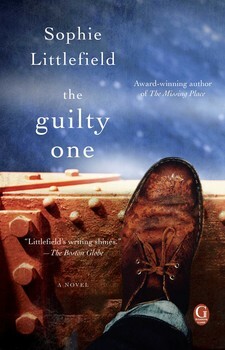 I’m no stranger to Sophie Littlefield’s works, having previously read and enjoyed four of her other books. And I like The Guilty One to an extent. It’s about life AFTER crime, for parents of the perp and the victim. Can people escape generations of violence, or are they – like their forefathers – doomed to hurt those they love? Had The Guilty One been more honestly marketed, it would’ve been received better. Still, it’s great to see a positive representation of women being friends. Done with December 2015 Releases? Here are January 2016 Releases. For future releases, check Reading Wishlist. Maris’s safe suburban world was shattered the day her daughter was found murdered, presumably at the hands of the young woman’s boyfriend. Her marriage crumbling, her routine shattered, Maris walks away from her pampered life as a Bay Area mom the day she receives a call from Ron, father of her daughter’s killer. Wracked with guilt over his son’s actions (and his own possible contribution to them), he asks Maris a single question: should he jump? With a man’s life in her hands, Maris must decide, perhaps for the first time, what she truly wants. Retribution? Forgiveness? Or something more? Having lost everything, she’s finally free to recreate herself without the confining labels of “wife,” “mother,” or “mourner.” But will this shocking offer free her, or destroy her? Done with July 2015 Releases? Here are August 2015 Releases. For future releases, check Reading Wishlist. If reading this in a feed-reader, the formatting may be off. Click on the title to see the post properly at WordPress.